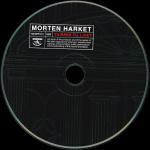 The first single "Tilbake Til Livet" (Back To Life) from Morten's Norwegian album "Vogt's Villa" is released in Norway on a promotional only 1-track CD-single for Norwegian Radio stations. It is released on Norsk Plateproduksjon A/S a sub-division of BMG Entertainment. The cover features a bluetoned black and white-shot by Knut Bry of smiling Morten looking down to his right. In the top left corner, the title is written in white and Morten's ignature is printed in red. This text is outlined by black boxes. The spine is light blue with black titles. The reverse of the insert is black with a bluetoned black and white picture of the building "Vogts Villa" filling about 2/3 of the space on the right hand side. Some white text is printed on the black background on the left side. The CD is of a similar design as the album "Vogts Villa". It is black with dark grey embossed details of parts of the "Vogts Villa" building. White and red titles and a small white "Norsk Plateproduksjon"-logo are placed inside white box outlines at the top left hand side. The CD features the edit version (3:59) of the song and doesn't include the mandolin introduction of the regular album edition.